« YouTube offers a "sneak peak" into future plans; where's the high-quality streaming? Shame on you Sony Ericsson. Shame on all you mobile handset manufacturers. You let Apple, a computer turned consumer electronics company, steal your show at the Mobile World Congress this week in Barcelona. Except for the curiosity factor of Google’s open-source mobile operating system Android, does anybody but mobile techies and the media (Macworld roundup) even remember what new models, services, or strategies were introduced by the world’s leading handset makers? 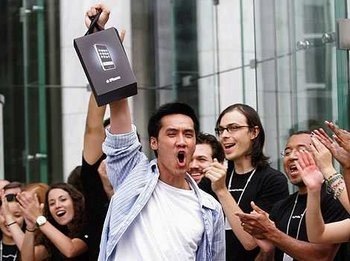 And you can bet that all consumers hear in news reports is Apple this, Apple that, and iPhone, iPhone, iPhone. It’s AT&T’s mobility chief executive, Ralph de la Vega, calling the iPhone a “game changer”. It’s Dow Jones reporting that some 95 percent of AT&T iPhone users regularly surf the Internet, or 30 percent of those people are new surfers to the mobile Web. It’s Nokia, Sony Ericsson, Samsung, LG, Motorola — and maybe even Research in Motion, makers of the Blackberry — who have announced touchscreen versions of their phones. It’s just plain weird — and sad — that Apple waltzes into the biggest wireless show of the year and garners this much effusive attention, especially since iPhone-like concepts have bandied about, unmade, for years. It’s almost deja vu. Only a few years ago Apple waltzed into the music industry and — whether it set out to do this or not — ended up defining the future of digital music by introducing the the iPod, the iTunes Music store, fixed pricing, elegant product design and intuitive interface, all of which resulted in social hipness and an ecosystem no one else has yet to duplicate. With the exception of Nokia, we get the sense after the Mobile World Congress that handset manufacturers, the wireless carriers, those working on the Google-led Android initiative, and the others toiling on alternative products (like the LiMo Foundation’s open-source OS project and the Modu modular cell phone) are rushing to play catchup . . .
. . . at a time when Apple is about to release a software developer kit that’s poised to take the iPhone to the next level.